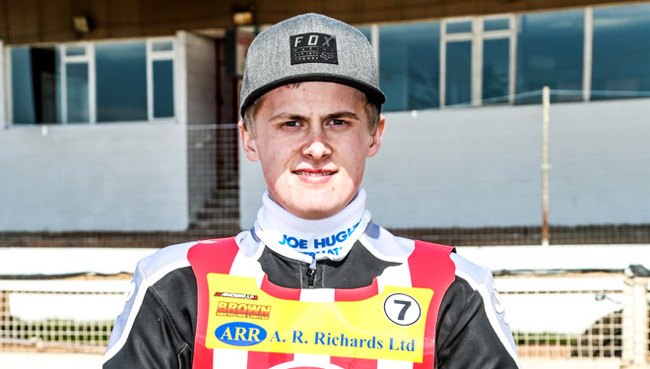 STOKE reserve Joe Alcock will travel to the Isle of Wight in the British U-21 semi-final which will take place at the Smallbrook Stadium on Tuesday 16th April. The Potters youngster will be looking to qualify for the final at Berwick where the top three riders from the two semi-finals will travel to the Border track where they will join ten seeded riders. SEMI-FINAL 1, ISLE OF WIGHT, April 16: Ryan Kinsley (Scunthorpe), Anders Rowe (Somerset/Kent), Jordan Jenkins (Kent), Luke Ruddick (Edinburgh/Leicester Lion Cubs), Ben Woodhull (Belle Vue Colts), Alex Spooner (Kent), Jordan Palin (Belle Vue Colts), Joe Alcock (Stoke), Jamie Bursill (Plymouth), Nathan Ablitt (Kent), Connor King (Isle of Wight), Chad Wirtzfeld (Isle of Wight). SEMI-FINAL 2, SOMERSET, April 19: Jack Parkinson-Blackburn (Unattached), Henry Atkins (Somerset), Jason Edwards (Mildenhall), Joe Lawlor (Unattached), Luke Harris (Cradley), Jamie Halder (Leicester Lion Cubs), Charlie Brooks (Mildenhall), Kelsey Dugard (Leicester Lion Cubs), Sam Bebee (Mildenhall), Macauley Leek (Mildenhall), Lewis Whitmore (Cradley), Harry McGurk (Cradley). BRITISH UNDER 21-FINAL SEEDS: Robert Lambert (King’s Lynn), Dan Bewley (Belle Vue), Zach Wajtknecht (Swindon/Birmingham), Nathan Greaves (Redcar), Jack Smith (Redcar), Jack Thomas (Leicester), Drew Kemp (Sheffield/Kent), Leon Flint (Berwick/Belle Vue Colts), Tom Brennan (Eastbourne/Cradley), Kyle Bickley (Glasgow/Belle Vue Colts).